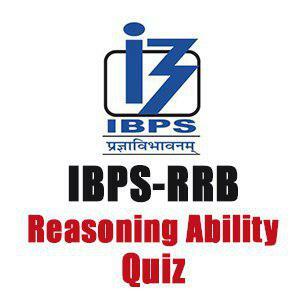 Mahendra Guru September 12, 2018 Important Reasoning Questions For IBPS RRB PO/Clerk, Reasoning Ability For IBPS RRB Clerk/PO, reasoning questions. 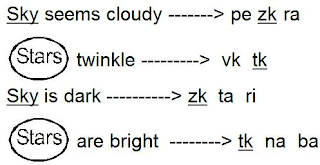 “Sky seems cloudy" means "pe zk ra"
"Stars twinkle" means "vk tk"
"Sky is dark" means "zk ta ri"
"Stars are bright" means "tk na ba"
एक निश्चित कोड भाषा में. “Sky seems cloudy" का अर्थ "pe zk ra"
"Stars twinkle" का अर्थ "vk tk"
Sky is dark" का अर्थ "zk ta ri"
Q.1. Which of the following is the code for "twinkle"? "twinkle" के लिए निम्न में से कौन सा कोड है? Q.2. What is the code for "dark”? "dark” के लिए कोड क्या है? Q.3. What does the code "zk" represent? कोड "zk" क्या दर्शाता है? Q.4. What is the code for “bright”? “bright” के लिए कोड क्या है? Eight persons L, K, J, H, G, F, D and S are seated in a straight line but not necessarily in the same order. Immediate neighbours of F, D and K are facing towards North. L, who is third to the right of H, is not the neighbour of F. D is between J and L. G is not at any end of the row and is not the neighbour of S. H is at one end of a row and is not the neighbour of J. Same direction‘s persons are not neighbour of each other. Q.6. Who is fourth to the right of J? J के दायें चौथा कौन हैं? Q.7. Who is second to the left of K? K के बायें दूसरा कौन है? Q.8. What is definitely true regarding J? 1. J is facing towards south. 2. J is between D and K.
3. J is third to the left of K.
4. J is fourth to the right of G.
5. J is facing towards north. J के सन्दर्भ में निश्चित रूप से क्या सत्य है? Q.9. Four of the following five are alike in a certain way and so form a group. Which one of the following does not belong to the group? निम्नलिखित पांच में से चार एक निश्चित तरीके से एक समान है और इसलिए एक समूह बनाते है।निम्न में से कौन सा एक उस समूह से सम्बधिंत नहीं है? Q.10. Which of the following pairs represent the persons who are at both the extreme ends? निम्नलिखित जोड़े में से कौन सा उन व्यक्तियों का प्रतिनिधित्व करता हैं जो दोनों अंतिम छोरों पर हैं ?